The primary objective of our laboratory has been to further our understanding of transcriptional regulation governing vascular development, vascular homeostasis, and vascular disease. We have focused on endothelial-specific transcription factors Sox7 and Sox17, which belong to the SoxF subfamily, in order to understand main transcriptional regulation in various vascular contexts . Our studies established Sox7 and Sox17 as proangiogenic regulators in vascular development and elucidated molecular mechanisms underlying their expression and function. We also discovered that Sox17 in brain arteries is crucial in maintaining vascular integrity during adulthood and its absence can lead to intracranial aneurysm, a major cause of hemorrhagic stroke, in hypertensive conditions. Going forward, we are trying to understand vascular changes in the central nervous system, including the brain and retina. What are their vascular characteristics of glioblastoma, a deadly brain cancer? What are the fundamental mechanisms underlying blood-brain-barrier and blood-retina-barrier breakdown leading to various brain diseases? By answering these question, we hope to develop therapeutics for glioblastoma and rescue barrier function of CNS vessels. 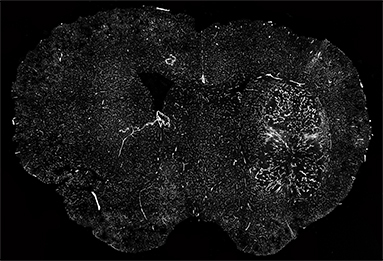 Normal(left) and tumor(right) vessels in mouse brain.